It is common knowledge that a woman in the United States makes 80 cents per dollar made by a man of similar qualifications. The pay gap is worse for women of color. In an era when women make up nearly 50% of the workforce, this pay gap burdens individual family finances and the economy. A recent study estimated the impact on society if the pay gap was corrected. How would closing the pay gap be expected to impact families? 60% of working women and 66% of single working mothers would see an increase in their pay. Poverty rates for working women would drop by half, from 8% to 3.8%. Poverty rates for single working mothers would drop from 28.9% to 14.5%. How would the U.S. economy benefit? 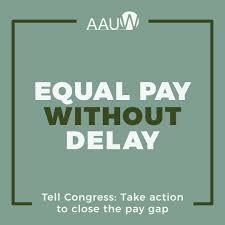 Closing the pay gap would increase gross domestic product an estimated $500 million, roughly 2.6% of the GDP of our entire nation. The increase in women’s earnings would be roughly 16 times what federal and state governments spent in 2015 for temporary assistance to needy families. 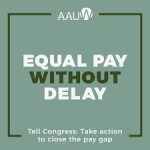 The pay gap adversely impacts American families. Closing it would raise many out of poverty and reduce the need for public assistance. The question to ask our elected officials is not whether we as a society can afford to pay men and women the same income for the same work. The question is, how can we afford not to? This entry was posted in Newsletter, Public Policy on April 4, 2019 by angelascarlett.